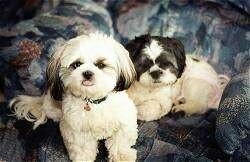 Malysh and Knopka the Shih Tzus at 8 years old—"My two Shih Tzus are my best friends!! They are brother and sister. The male was a runt. 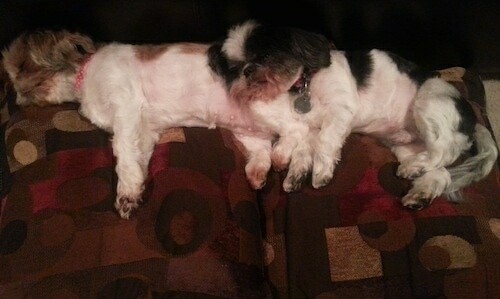 Praise God for Cesar Millan, because as soon as I began learning from him, my dogs became followers, NOT leaders. The female (Knopka) has such a character. She is the one that makes up all the mischief. 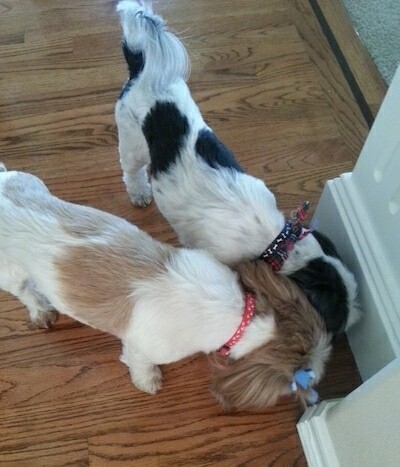 There was a time when they used to dig holes under the fence (yes, Shih Tzus), and since she is slightly larger than him, she couldn't get through, but he did. 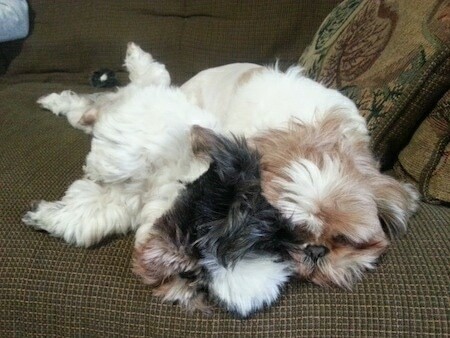 She would bark and bark at him to come back (: They are one of the smartest dogs, and when I feel down, Malysh (male) always knows how to cheer me up :) "
"I'd like everyone to meet my love, Bingo…a 12-year-old male Shih Tzu. I found him at the pound one day before he was going to be put to sleep. He was about a year old. I taught special education and Bingo was trained for special ed. as a therapy dog. For 10 years we went to school together. Bingo was the bridge between the adults and the special needs children. When some students first came to the school they couldn't relate to humans, but he opened the gate. There was autism, retardation, Down syndrome, some can't talk, others can't hear, some extreme behavioral problems, but they all had one thing in common—a bond with a dog named Bingo. He was a positive dimension for the children; most were motivated to finish their work because they knew they would earn Bingo time. 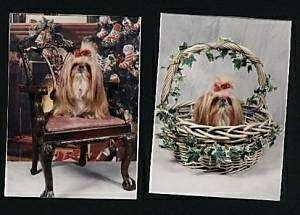 They would be able to walk him, feed him, brush him and dress him up from a suitcase full of costumes. He took a lot of abuse. He was pinched, kicked, poked and bitten, but he never retaliated. He seemed to understand it was unintentional. He has jackets, sweaters, shirts, booties, pants, hats, glasses, jewelry, and on different holidays, he's been a cowboy, a wizard, an Indian, a pirate, a devil, a jailbird, a doctor, a dinosaur, a firedog, a police dog, biker dog... the list goes on and on. All of the children would sing several times a day, "There was a teacher who had a dog, and Bingo was his name-O, B- I- N- G-O.... I gave Bingo a top-knot the day I got him. He wears it to this day, and the kids would always want the teachers to give them a top-knot while they were at school. He did have one little annoying habit he enjoyed; at least a couple of times a month would grab someone's sandwich and run with it. " 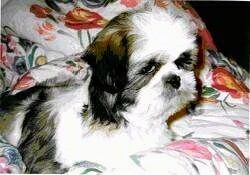 Miya the Shih Tzu puppy at 3 months old after her first haircut—Miya has one blue eye. 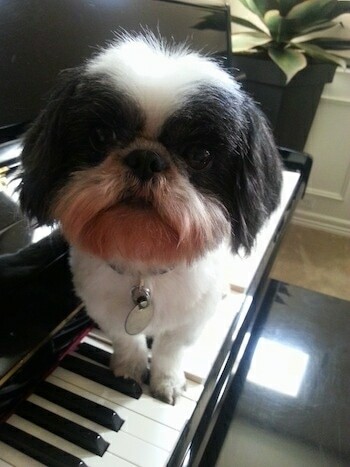 This is Miya. 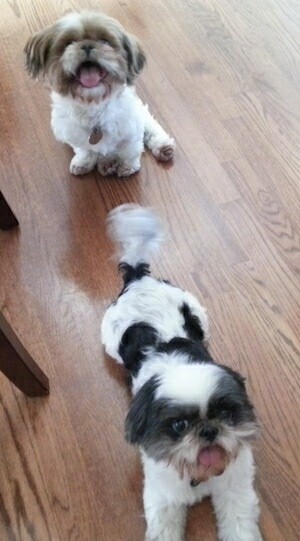 In this photo Miya has just stolen her big brother Molson's bone. Molson is a black Lab / Blue Heeler mix. Miya is seen here with her friend Sheridyn. Miya's trademark is her tongue sticking out. Her owners know if she isn't sticking her tongue out, she isn't feeling well. 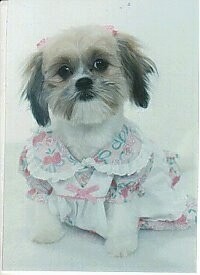 Tiffany is owned by Darrell and Michelle Ferrouillat of Saraland, AL. This sweet little princess is named Nena. This picture is affectionately called 'Corn Dog,' by this dog’s owners. 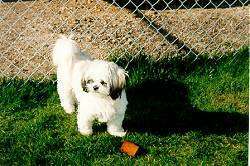 Their 8-year-old Shih Tzu managed to wrap her mouth around a fallen corn on the cob, and before they could pick it up, she did, and would not for her life give it up. They decided to take a picture, and this is what they got. Dogs have been known to swallow large parts of corn cobs, or the entire cob and need surgery to have it removed from their stomach and/or intestines. 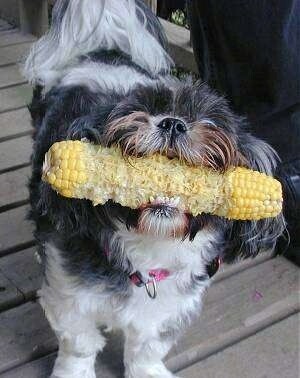 Use caution when eating corn on the cob around a dog.